The ongoing Kīlauea volcano eruptions in Hawaii have led to the formation of a tiny, new piece of land made of lava on the Fissure 8 ocean entry's northernmost part, according to the United States Geological Survey's Hawaii Volcano Observatory (HVO). 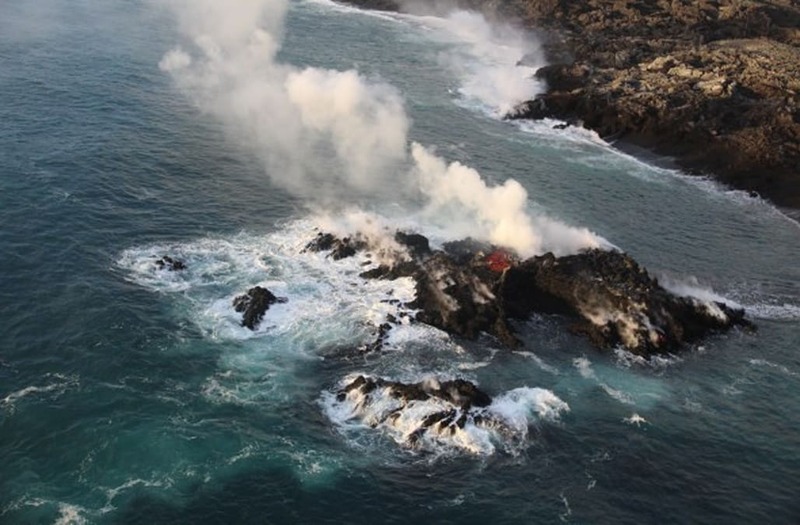 The HVO announced on Friday that during a morning overflight, its field crew observed that the land formation oozed lava similar to the lava that oozed from the broad flow front along the coastline. The land formation, which was initially considered to be an island, is estimated to be a few meters off the shore and about 6-9 meters (20-30 feet) in diameter, the HVO reported. "It's most likely part of the Fissure 8 flow that's entering the ocean and possibly a submarine tumulus that built up underwater and emerged above sea level," said HVO scientists. Kilauea volcano's summit lava lake shows a significant drop of roughly 220 metres below the crater rim in this wide angle camera view showing the entire north portion of the Overlook crater in Hawaii, U.S. May 6, 2018. Picture taken on May 6, 2018. USGS/Handout via REUTERS ATTENTION EDITORS - THIS IMAGE HAS BEEN SUPPLIED BY A THIRD PARTY. A new fissure spraying lava fountains as high as about 230 feet (70 m), according to United States Geological Survey, is shown from Luana Street in Leilani Estates subdivision on Kilauea Volcano's lower East Rift Zone in Hawaii, U.S., May 5, 2018. Photo taken May 5, 2018. US Geological Survey/Handout via REUTERS ATTENTION EDITORS - THIS IMAGE WAS PROVIDED BY A THIRD PARTY. A fissure on Leilani and Kaupili Streets in the Leilani Estates subdivision caused by an eruption of the Kilauea Volcano is shown following a series of earthquakes, in Hawaii, U.S. on May 4, 2018. Picture taken on May 4, 2018. USGS/Handout via REUTERS ATTENTION EDITORS - THIS IMAGE HAS BEEN SUPPLIED BY A THIRD PARTY. Steam cracks are shown before a fissure opened on Kaupili Street in the Leilani Estates subdivision caused by an eruption of the Kilauea Volcano is shown following a series of earthquakes, in Hawaii, U.S. on May 4, 2018. Picture taken on May 4, 2018. USGS/Handout via REUTERS ATTENTION EDITORS - THIS IMAGE HAS BEEN SUPPLIED BY A THIRD PARTY. An HVO geologist collects samples of spatter by fissure 10 from the Kilauea volcano, in the Leilani Estates in Hawaii, U.S. May 6, 2018. Picture taken on May 6, 2018. USGS/Handout via REUTERS ATTENTION EDITORS - THIS IMAGE HAS BEEN SUPPLIED BY A THIRD PARTY. USGS scientists monitor Kilauea volcano's eruption spatter on the roads in the Leilani Estates in Hawaii, U.S. May 6, 2018. Picture taken on May 6, 2018. USGS/Handout via REUTERS ATTENTION EDITORS - THIS IMAGE HAS BEEN SUPPLIED BY A THIRD PARTY. A tumulus is formed when the upward pressure of slow-moving molten lava within a flow swells or pushes the overlying crust upward, according to the Volcano Hazards Program. The surfaces of basaltic lava flows on flat or gentle slopes often exhibit elliptical, domed structures that are known as tumuli. USGS Volcanoes tweeted on Sunday that the formation has been connected to the main flow front by a strip of lava, so scientists no longer consider it to be an island. It has been reported that more than a mile of new land has been created from the Kīlauea volcano's lava flowing into Kapoho Bay, according to USGS officials.